The Council of Jerusalem Churches has achieved a new victory against the Israeli government, with an “unprecedented number of US churches condemn[ing] Israeli attempts to confiscate church lands,” a Council statement – a copy of which was sent to MEMO – said on Friday. “The extent to which the Jerusalem Patriarchs and Heads of Churches consider this legislation to be an existential threat cannot be overstated”. In July, the Council of Jerusalem Churches called on Israeli Prime Minister Benjamin Netanyahu to prevent discussion of the bill “because it serves racist groups and undermines the status of churches”. 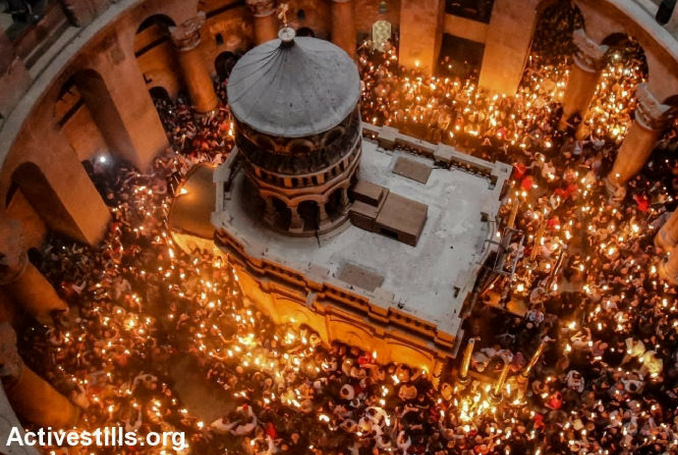 Theophilos III warned the Israeli government that approving this law would push the Council of Jerusalem Churches to close the Church of Holy Sepulchre, in partnership with the heads of all churches in the world. In February, the Council of Churches closed the Church of Holy Sepulchre in protest against a proposed municipal tax on church property. Be the first to comment on "Jerusalem Churches Achieve New Victory against Israel Government (VIDEO) #Palestine #GroupPalestine #israelTerrorists #boycottIsrael"